It is with extreme sadness that I have to report that Tina Holden, the founder of MSTinaTV and Tina Holden International, passed away on November 27, 2018. Tina leaves an extraordinary legacy as an entrepreneur, newspaper publisher, event organizer, education supporter and volunteer. Even though Tina was diagnosed with MS in 2011, she didn’t let that stop her. 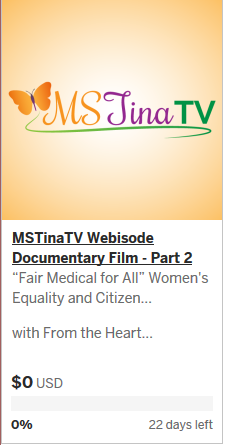 She always had big dreams, and this diagnosis inspired her to create a webisode / documentary series to promote fair medical treatment for all. It was my privilege and pleasure to give Tina guidance in using social media to promote her cause. I hope this blog will inspire others to take up her cause and find a cure for MS too! Thanks for the memories, Tina! Tina Holden International, Inc is a go to resource for women in business. The contemporary, woman-owned organization was developed to encourage women of all ages to dream while awake, never falling asleep while on their way to their destiny.